At a ceremony held yesterday, Florida International University (FIU), Carnival Corporation & plc and Carnival Cruise Lines marked the dedication of the new Carnival Student Center at FIU’s School of Hospitality and Tourism Management located at the university’s Biscayne Bay Campus. Located adjacent to the campus’ bayside terrace, the modern facility encompasses more than 2,600 square feet and has been completely renovated and repurposed to create an attractive and inviting gathering place for students. With an advising center, reading room, computer workstations and fully-equipped conference rooms, a variety of groups and organizations, from students to industry executives scouting prospective interns and employees, can utilize the new multi-functional space. 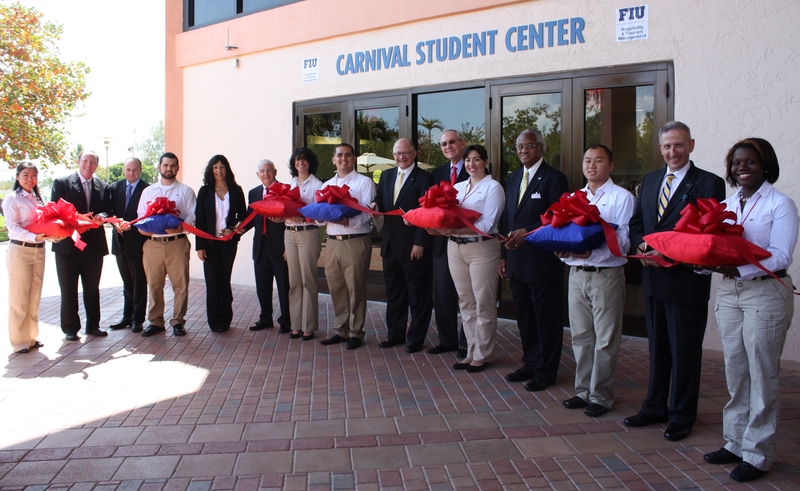 The Carnival Student Center was made possible by a gift to FIU’s School of Hospitality and Tourism Management from Miami-based Carnival Corporation & plc and its flagship brand Carnival Cruise Lines. The gift also includes an endowment for scholarships, the first of which were awarded to two deserving FIU Hospitality and Tourism Management students at today’s ceremony: Fabiana Ferrer, a sophomore, who is involved in leadership and volunteer activities at FIU, serving as a peer advisor, orientation leader, past VP of Academy of Hospitality and Tourism, and chair for the Panther Power Council; and SherAaron Hurt, a graduate student whose career objective is events management, and is currently an executive assistant in the School’s hospitality advising office, and a member of several professional organizations including the Alpha Phi Omega Service Fraternity and the National Society of Minorities in Hospitality. The funding for the renovation of the Carnival Student Center and these scholarships qualified for a match by a grant from the state of Florida. “Today’s debut of the Carnival Student Center is exciting for all of us because this project exemplifies the way in which FIU School of Hospitality and Tourism Management aligns with community and industry partners to keep students Worlds Ahead, exceeding expectations and creating new possibilities,” said Mike Hampton, dean of Florida International University’s School of Hospitality and Tourism Management. FIU’s acclaimed School of Hospitality and Tourism Management has one of the highest rated programs in the United States. The school’s alumni hold prominent positions throughout the hotel, travel and food service industries, including Carnival Cruise Lines and Carnival Corporation & plc. At least a half dozen FIU School of Hospitality and Tourism Management alumni hold high-ranking jobs within Carnival, including Carnival Corporation & plc’s Vice President and Chief Audit Executive Richard Brilliant MS ’93. Carnival has been a part of the South Florida community since its inception in 1972 and has since grown into a global cruise company with a portfolio of cruise brands sailing on worldwide itineraries. Carnival Corporation & plc operates a fleet of 98 ships, including 22 sailing under the Carnival Cruise Lines umbrella. For more information on Carnival Corporation & plc and Carnival Cruise Lines is available at www.carnivalcorp.com and www.carnival.com, respectively. Additional information on FIU’s School of Hospitality and Tourism Management please visit www.hospitality.fiu.edu.